Many people are bothered by the label "atheist." Some believe that it communicates incorrect information about them, for example, that they think they know for sure that no god(s) can or do exist. Others fear that it carries too much emotional baggage. Thus, many seek out something more neutral and respectable-sounding, even if effectively means the same thing. At the age of nine, I stopped believing in the existence of gods, because there seemed to be no evidence for the kind of supernatural power asserted by those around me. I don't see my lack of religious belief as a matter of ideology, which is why I prefer the term "non-believer" to the term "atheist" (one who actively disputes the existence of gods, often in a militant fashion) or "agnostic" (one who doesn't think there is enough evidence one way or another to determine if gods exist). Saint-Andre is making two (related) errors here. First, he is assuming that every time we see the "-ism" ending on a word we are therefore looking at a label for some ideology, belief system, religion, etc. Second, he is assuming that "atheist" is only defined by the very narrow idea of actively disputing the existence of gods. It is not true that everything with the -ism suffix is some sort of ideology. Terrorism isn't an ideology, it's a practice or tactic. Heroism isn't an ideology, it's a characteristic or quality. A person with astigmatism is not a person whose ideology consists of not forming any points (though I've encountered people who could, in theory, be described in such a way). It's true that the suffix -ism often signals an ideology, but it also can signal some state, attribute, or characteristic that is not reliant upon any particular ideology. This is to be expected because the English -ism derives from the Greek -ismos, which means "the act, state, or theory of." The term "atheist" doesn't really mean anything different from the term "nonbeliever" (in gods). An atheist is merely someone who lacks belief in gods -- a person who isn't a theist. Atheism is the state of not having any belief in the existence of any gods. 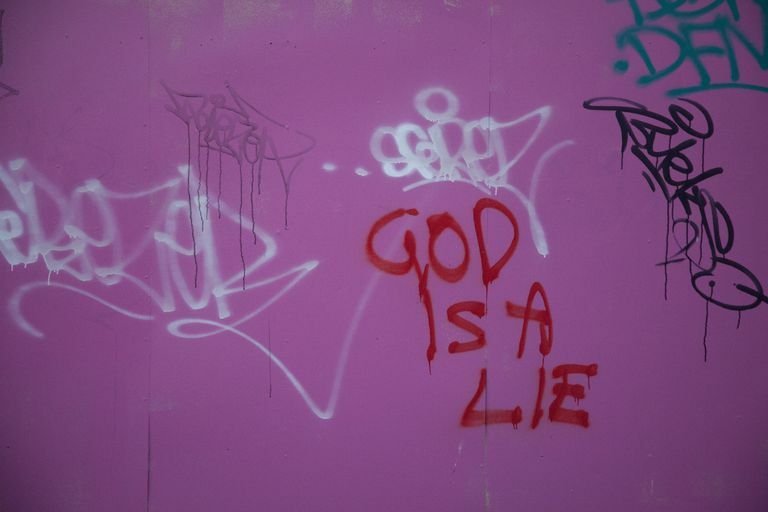 Some go on to actively dispute the existence of some or all gods and some may do so militantly, but this isn't a precondition of being an atheist. Some are atheists in a very apathetic way, not believing in any gods and not particularly caring that others do. Atheism isn't an ideology, isn't a belief system, and isn't a religion -- though, like theism, it can be a part of all three. Of course, if nonbelievers continue to be ashamed of atheism or continue to imagine that it is defined in the manner that evangelical Christians would like to define it, people will remain confused on the matter. By contrast, we do not attach the "-ism" suffix to the recognition of facts. No one describes themselves as a "heliocentrist" -- they simply recognize the fact that the earth revolves around the sun. To describe one person as a heliocentrist and another as a geocentrist would be to put observable facts and unprovable dogmas on an equal footing, and that's just wrong. Now that's just absurd. I would certainly describe myself as a "heliocentrist" if I happened to be talking to a "geocentrist" about the organization of the solar system. There are geocentrists so such a situation isn't impossible, but it is unlikely so I don't expect it to happen any time soon. Just because it's unlikely, though, doesn't mean that such a label wouldn't be accurate. A heliocentrist is anyone who thinks the earth orbits the sun; a geocentrist is anyone who thinks the sun orbits the earth. Use of those labels is, to use Peter Saint-Andre's words, a recognition of observable facts and not an attempt to place them both on equal footing. Using a word ending in "ism" to describe two different states or conditions or two different ideologies does not imply that one regards both as equal in any way. It's just the correct use of language; in contrast, the refusal to use language correctly in order to score debating points is just juvenile.